This balance bike ride is perfect for kids learning to balance and steer on their first wheels. 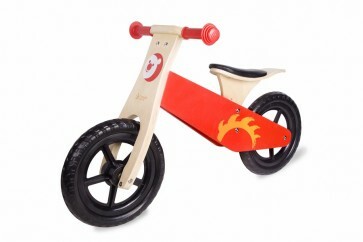 The Red Balance Bike by Classic World is the perfect first foot powered bike for little ones. Your child will begin to learn the basic skills of riding a bike vehicles while at the same time they can feel confident cruising around. With rubber tires to avoid your little ones get a puncture when they riding. Seat can be easily adjusted to a child's individual height giving it a comfortable edge. Provide kids the confidence they need to ride a bike by practicing their balance and skip the training wheels. Once they feel comfortable walking with the bike and balancing, encourage them to coast and steer on their own. Your child will begin to learn the basic skills of riding a bike while at the same time they can feel confident cruising around the living room, hallways, and your backyard. Perfectly suited for short rides to the park or exploring the world right around them, the Red Balance Bike by Classic World gives your child the confidence they need to ride a bike through building their balance skills without the training wheels.